Which Water Filtration System is Best? Last week, I dove into the research behind water filtration systems. If you haven’t read it yet, check it out HERE. But now, the obvious question is — so which system is really the best one? Company, type, get specific! Several of you have asked, so here we go. Reverse Osmosis — Strips all minerals from the water, doesn’t remove all bacteria, nitrates, pesticides, etc. Unstable, acidic, and strips minerals from the body. Aluminum-based fluoride filter — Can leave traces of aluminum in the water (possibly) and we’re trying to avoid that. Other types of carbon filters — Coconut is the most effective at removing contaminants and also the most renewable, which is why I prefer that to other types of carbon. UV filter — It’s just not necessary for my system (tap water). It may be a smart extra step for those on well water, as it helps to kill bacteria that may be in the water. Salt-based water softener — Messy and annoying to use, and also strip the beneficial minerals out of the water. Would be good only on appliances, but not for drinking water. A salt-free softener does not remove the minerals and is a good option if you need a softener at all. Now that we know what we’re looking for…let’s look at the systems out there and see which ones meet those needs! Most systems have a “sediment pre-filter” which is just a membrane that catches dirt, small rocks, etc. You want this, especially if you have well water. This part is pretty standard and not controversial. Some cities fluoridate their water, but about a third in the US do not. Check if you need a fluoride filter before purchasing one; they are expensive. Some cities use chlorine to treat the water, and others use chloramine. They are filtered a bit differently, so check to see which your city uses. Please note, NSF-certified means that the company has passed third-party tests showing that their filters actually do what they say they are supposed to do. It’s an international organization that makes sure that food and water products (and companies that produce them) are safe. You can check any company HERE. Notes: This system does not filter fluoride and does not have an attachment that can do so (I emailed to ask). So, if you do not have fluoride, it could be a good option. It has several “extras” available, like the salt-free water softener and the UV filter, as well as a pro-install kit for the DIY-er. The basic system is very affordable. It’s a good option for those on well water or city water that isn’t fluoridated. Notes: This has been the go-to filter for years in the natural community. It’s relatively affordable (cost varies based on gallons the unit holds — 1.5 to 6 — and number of filters in it) and claims to filter everything but the beneficial minerals. The fluoride filters are made of alumina (a form of aluminum) so, although Berkey claims that they don’t put any aluminum in the water, I can’t recommend them. Additionally, these fluoride filters only work well in water that has a pH of 5 – 7, while most tap water is going to be more like 7 – 8 (source). (Water is not supposed to be acidic.) It’s rather bulky, and some do not have the counter space for it. There has also been some controversy about the effectiveness of Berkey filters. One example is HERE. Others say it does just fine, like HERE. Notes: This has a broad price range. The “basic” system that includes the coconut shell carbon and copper-zinc mineral filtration (for the whole house) is $850. If you need a water softener, it jumps up to over $2000. The fluoride filter add-on is $1490 (for the whole house). UV filters are separate too. This can get quite pricey, but it depends on your needs. Can be self-installed or can hire a plumber. The system I chose (this is the one we’ll go with) will cost $2345. That is the “basic” whole house system with the whole-house fluoride filter add-on. Type(s) of Filtration: Catalytic and coconut shell carbon; anti-RAD; calcium substrate and bone char. Notes: Removes chlorine, chloramine, bacteria, viruses, radiation, fluoride, and a number of other contaminants. One of the most comprehensive systems. Price depends on addition of separate chloramine filter and leak protection (optional). Must be installed be a certified plumber, which may be a downside if you’re more a DIY-er. Notes: They say it’s “impossible” to filter water to your whole house without RO for under $10K, which is NOT what my research has shown at all. Perhaps that was true 10 years ago, but it isn’t now. I find this misleading. Also, this system is unnecessarily complicated, using carbon to filter, then RO, then multi-stage remineralizing. It also requires a large holding tank, which means it takes up more space. It will do the job…but there are less complicated, smaller, cheaper systems that will, too. Notes: Does not do fluoride. Only available through a dealer, so you have to find a local person and invite them into your home to access it. Notes: It has one single set of filters that reduce everything, not multiple stages. It does filter out fluoride and does not use aluminum. It seems like a very good option for both whole house and counter top models. The rating system took into account whether the system could do the whole house or just a single location (more points for whole house), whether it was available to purchase individually or only through a dealer (more points for individually), whether or not it filtered fluoride (more points if yes), whether or not it was NSF-certified (more points if yes) and general cost. Only two systems took the top rating! Pelican Water Systems — This is the one I’m choosing. It does the whole house, it filters fluoride (with the add-on), it’s NSF-certified and reasonably affordable. It’s also available for purchase directly through their website. Propur — They have a new whole house system that filters everything, including fluoride, with one set of filters. They’re NSF-certified and available for purchase directly. I didn’t choose this mostly because they weren’t as transparent about what’s in their filters as Pelican, but I also didn’t ask as many questions. If you currently have a Berkey, I would recommend keeping the unit but swapping its filters out for the Propur filters. They’re only $25 for a pair, HERE. An honorable mention, Aquasana. They’re affordable and they have a great system, but it doesn’t filter fluoride. If you don’t need to filter fluoride, that may be a great option for you. I hope this was helpful! If you have any other systems you’re looking at, feel free to ask me about them! 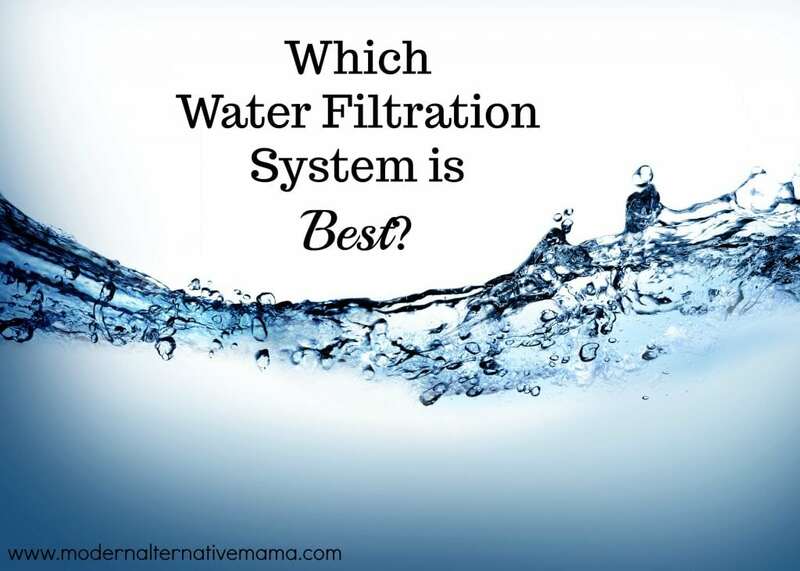 Which water filtration system did you choose? During your research have you looked into Crystal Quest filters? We have a whole house water filter from this company and I would love to read your thoughts on it. Also, you should ask what the NSF certification is on for the Pelican. It’s definetly not for the fluoride side they are claiming. Could you expand on that statement? We are considering the Pelican system. We have had the Pelican combo system in our home for over 5 years now, and love it! Getting all the chlorine out of our water has made a huge difference in our water. I’m surprised (and bummed) that you didn’t review the Multipure system! Your link to the ProPur filters you recommend for Berkey systems is for the G1.0 (which does NOT filter out fluoride) rather than the G2.0 (which does filter out fluoride). The price increase is pretty substantial. You might make that more clear so no one mistakenly buys something that can’t filter fluoride. I’m curious to know your thoughts on drinking natural spring water. I’m fortunate enough to live by a city-managed free flowing artesian spring. I fill large glass carboys snd my family uses that as our drinking water. Thanks, helpful article. I wanted to know the difference between water filters and water filtration system. Radiant Life claims that the 14 stages and whole house systems are NSF certified. In your article you claim that the 14 stage is not.. any thoughts? Thank you so much! This is a great post! My parents want to make sure that our water is safe for consumption. It was explained here that when looking for a water filtration system, it should be carbon-based. Moreover, it’s recommended to hire professional plumbers for water filtration system. Thanks for the tip about considering how coconut filters are nice for a water filtration system. It would be good to consider what type of filter will last the longest as well. My husband and I are looking for a new water filtration system, so we’ll have to consider coconut. What do you think about the Hellenbrand ProMate 6.0-DMT water softener and filtration system for the whole house for $2,300? I would love to get your expert opinion on this system. It removes adverse minerals and hardness reduction. It uses either salt which is the cheaper option for maintenance or it uses carbon which is the more expensive option since only replaced by Hellenbrand dealer. Please let me know your honest opinion before I purchase anything. Thank you so very much for your time. Very helpful article. I am a newbie in choosing water purifiers. But after reading your article now it seems I have made my mind. Aquasana is the best choice for me. I am looking for whole house system and I called Pelican; unfortunately I do not think we will go that route because their system does not filter out chromium 6 (and the salesman claimed the only way to do that is RO which I already know is not true). In addition it seems that if you do not filter Chromium 6 out of your bathing water, you could inhale the fumes which are known to cause lung cancer. So an undersink system will not help in the shower. I’m still researching but I’m becoming very discouraged. It got me when you said that salt-based water softeners do not remove all the needed minerals which are good for both things and human. With that in mind, I will be choosing this system for our house to keep our water clean. We just don’t have one yet because we lack the money back then after this house was built, so we saved up for this first before having one installed. “[NSF is] an international organization”. Actually, NSF is a United States government agency, not international. It stands for “National Science Foundation”. The US wierdly likes to start their agency names with “National”, even when there are similar organizations in other countries. Does Propur’s new ProMax filtration system remove minerals from water? How is Pelican 6 stage RO system? Is it true that it doesn’t remove bacteria from the water and do they have add on item for removing bacteria? If not, can boiling water kill the bacteria? Hey! I just wanted to give you feedback on the Propur. I took your advice and switched my Berkey filter with the Propur. I was happy with it, but then My unit fell off the counter and the elements broke apart…so I had to order new ones. I just want to also say that’s I clean the containers monthly. When you get the Propur filters you need to fill the tank 3x before using…then it’s ready. When the new ones came I did as directed, but this time after the 3rd flush I decided to swipe the bottom with a paper towel and film of black sediment was on there. I flushed it several more times and still there was sediment. I called the company and they sent me 2 more, plus I had to more and the same results. I now am no longer using the Berkey Filter at all. I had problems with the Berkey elements as well, but a different issue. Just wanted to give this info in case anyone was interested in purchasing. I would advice against both. If you do choose Berkey I wouldn’t get the Royal or bigger. I think the one under is easier to maintain and hopefully works better.